The world around us is constantly changing. Global markets gain and tumble, economies rise and fall. Organizations need to constantly improvise and adapt to changing conditions. Concepts, theories and ideas about management, organizational development, entrepreneurship, leadership, employee motivation, and numerous areas surrounding the workplace keep on evolving. This is indeed necessary as the marketplace keeps changing. Amidst this continuous change there are things that are constant. There are principles that transcend time, place, people and culture. We refer to these as Timeless Principles. They hold true regardless of the variants of when, where, what and why. This is not a management book, but a book of Timeless Principles. In the workplace and because of it we encounter numerous challenges: corrupt sales processes, accounting malpractices, unscrupulous bosses, questionable advertising methods, employment terminations, the challenge of time for family, struggles with work-life balance, and many other situations. We need underlying principles to guide our professional practices and our daily lives. Principles that we can use at all times and in all situations. This book provides these Timeless Principles. 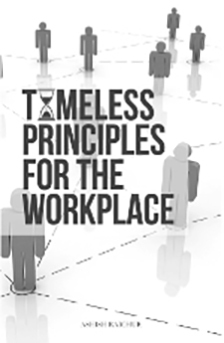 Entire organizations and businesses can be transformed as its people assimilate and apply these Timeless Principles.